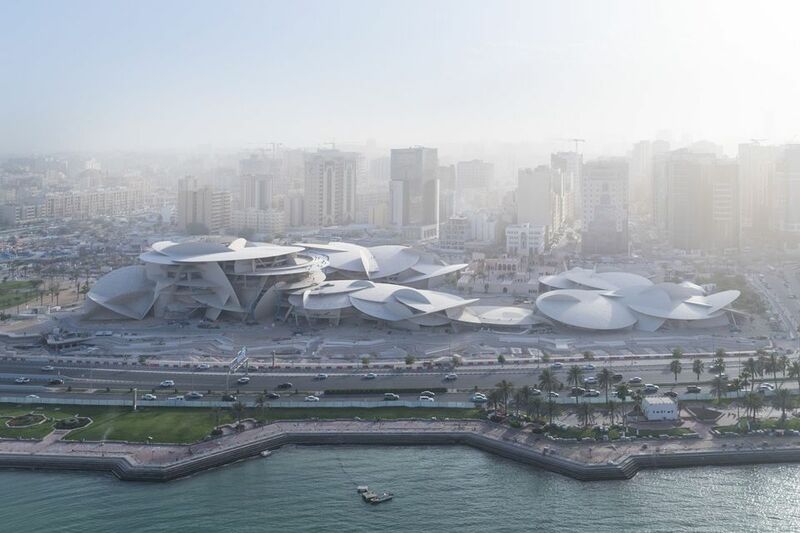 The National Museum of Qatar, designed by the French architect Jean Nouvel, is being inaugurated on 28 March 2019 by His Highness Sheikh Tamim bin Hamad bin Khalifa Al Thani. Located on Qatar's restored historic palace, it traces Qatar's history from 700 million years ago up to the present. Nouvel, who also designed the Louvre Abu Dhabi, drew inspiration from the crystalline forms that emerge in the desert as the basis for his design with curved discs, intersections and cantilevered angles. The museum is organised in three chronological “chapters”: Beginnings (the geological period prior to humans inhabiting the peninsula); Life in Qatar and Building the Nation, which are presented over 11 galleries. A centrepiece is the restored Palace of Sheikh Abdullah bin Jassim Al Thani (1880-1957), the son of the founder of modern Qatar, which was formerly the home of the royal family and the seat of government, before becoming the site of the original National Museum. The archaeological and heritage objects that will be on display include the Pearl Carpet of Baroda (commissioned in 1865), which is embroidered with more than 1.5 million Gulf pearls and adorned with emeralds, diamonds and sapphires, as well as manuscripts, documents, photographs, jewellery and costumes. For the museum's park, the French artist Jean-Michel Othoniel has made a vast installation of 114 fountains with streams evoking Arabic calligraphy, while Syrian artist Simone Fattal's sculpture, Gates of Sea, evokes the rock carvings, or petroglyphs, found at the site of Al Jassasiya in Qatar. Other commissions include a piece by Qatari artist Ali Hassan in the groundfloor public entrance, a work by Qatari artist and arts patron Sheikh Hassan bin Mohammed bin Ali Al Thani at the entrance to the galleries, and a sculpture by Iraqi artist Ahmed Al Bahrani in the outdoor space called the Howsh.